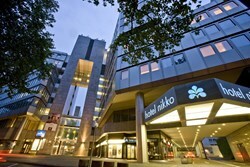 Hotel Nikko Düsseldorf is located within easy reach of the city center and the main station. With a capacity of 386 modern guest rooms it is the biggest hotel in downtown Düsseldorf. Furthermore the accomodation features 1.500 square meters of convention space and a fully equipped spa and fitness area. The “SKY SPA” offers a unique view over Düsseldorf while relaxing by the rooftop pool. Discover the authentic Japanese cuisine at the “Benkay” restaurant or enjoy international dishes at the “Torii Bar & Bistro”. Düsseldorf was again voted city with one of the best quality of life indexes worldwide. The state capital of Northrhine-Westphalia holds many highlights for all tastes and interests in store. Featuring Sights: Altstadt (Old Town), Burgplatz, and for all you car lovers: the Classic Remise Düsseldorf.